In Kyrgyzstan, a mountainous country of central Asia, the climate is continental, with cold winters, often frosty, and warm and sunny summers, sometimes scorchingly hot at low altitudes, but cooler in the mountains. Precipitation is moderate in the west, while the center-east of the country is arid, and even desert at lower elevations. From the vast deserts of the neighbouring countries, winds able to bring sandstorms can blow. In Kyrgyzstan, there are no plains, and the lowest areas are located between 500 and 1,000 meters (1,600 and 3,300 feet) of altitude. The capital, Bishkek (formerly Frunze), is located in the north, in the valley of the Chuy river, at an altitude ranging between 650 and 950 meters (2,100 and 3,100 feet). Here, the climate is continental, characterized by cold winters and hot summers, when the days can be scorching, often around 35/36 °C (95/97 °F), but with dry air and lively breezes in the afternoon. Here are the average temperatures of Bishkek. Precipitation is moderate, around 450 millimeters (17.5 inches) per year, with a minimum in summer (when only rare showers occur to interrupt the almost always sunny days) and a maximum in spring, between March and May. Here is the average precipitation. From the mountains located south of the city, a warm dry wind can blow in all seasons, while there are no obstacles to cold air masses coming from the north, which can bring intense cold waves. Therefore, the average temperature of the coldest month, about -2 °C (28.5 °F) in January, is just the result of very different situations: there are pretty mild periods, with temperatures around freezing (0 °C or 32 °F) at night and around 10/15 °C (50/59 °F) during the day, alternating with colder periods, during which the temperatures are near the average, but also glacial periods, during which lows can plunge to around -25 °C (-13 °F), and highs remain around -15 °C (5 °F). The records in Bishkek are respectable: the lowest is -34 °C (-29 °F), while the highest is as high as 43 °C (109 °F)! The sun in Bishkek regularly shines in summer, while it is not seen very often in winter, however, some sunny day can always occur. Here are the average sunshine hours per day. Osh, Kyrgyzstan's second largest city, is located in the south-west at 1,000 meters (3,300 feet) of altitude, and Jalal-Abad, the third, is at no great distance and at 750 meters (2,450 ft). 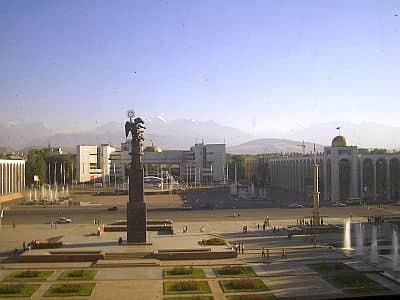 In these cities, the temperature is similar to that of Bishkek, with slight differences due to the altitude, but the more southern location, and especially the presence of mountain ranges to the north, make them less vulnerable to cold spells, however, glacial days are possible here as well. Kyrgyzstan is crossed by several mountain ranges: the Fergana Mountains in the north-west, the foothills of Pamir and Alay in the south-west, while in the center and east, we find the various branches of the Tien Shan, whose highest point is Jengish Chokusu (formerly Pik Pobedy), on the border with China, 7,439 meters (24,406 feet) high. At high altitudes, above 4,000 meters (13,000 ft), there are vast glaciers, which feed rivers, which in turn flow in deep valleys between the mountains. In the vast mountainous areas, winters get really harsh. In Naryn, 2,000 meters (6,500 feet) above sea level, the daily average temperature ranges from -15 °C (5 °F) in January to 17.5 °C (63.5 °F) in July. Here are the average temperatures. Throughout the year, 300 mm (12 in) of rain or snow fall, so the climate is still arid. However, the pattern is different from the western cities: there is a relative minimum in winter and a maximum in late spring, with some rains occurring even in summer because the central-eastern part of Kyrgyzstan is slightly affected by the Asian monsoon. Here is the average precipitation. 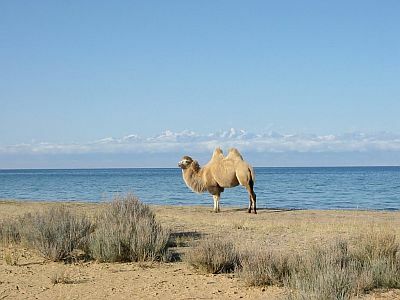 Karakol is located at 1,600 meters (5,250 feet), on the shores of Lake Issyk Kul, which is large enough to create a micro-climate, slightly milder than other areas of equal altitude in the country. Winters are cold here as well, with an average in January of -10 °C (14 °F), though the lake never freezes because it's salty. Summers are pleasantly warm, with highs around 23/25 °C (73/77 °F) and cool nights; in this periods, locals swim in the lake. If you want to visit the major cities of Kyrgyzstan and the lowlands, the best times are spring and autumn, especially the periods of April-May and September-October. Considering the climate variability and the diurnal temperature range, it must be said that it can be cold at night in April and October, and it can get hot during the day in May and September: you can therefore choose the intermediate periods (mid-April to mid-May and mid-September to mid-October). If you want to visit high altitude areas, summer is the recommended season, from May to September at around 2,000 meters (6,500 feet) and from June to August above 3,000 meters (9,800 ft), since it is the only period when the temperature rises above freezing. In winter: in Bishkek and the major cities, under a thousand meters (3,300 feet), bring warm clothes, such as a sweater, a down jacket, a hat, a scarf, and gloves; you will need some lighter clothes for mild days, and a scarf for the wind. In the Tien Shan and in high mountains, bring cold weather clothing, synthetic, thermal long underwear, a fleece, a parka, a wind jacket, and warm boots. In summer: in Bishkek and the major cities, under a thousand meters (3,300 feet), bring light clothes, a sun hat, a scarf for the wind, and a sweatshirt for the evening. In the mountains, at intermediate altitudes, bring light clothes for the day, a sun hat, a sweatshirt and a light jacket for the evening, and hiking shoes; above 3,000 meters (9,800 ft), add a sweater and a jacket for the evening; above 4,000 meters (13,000 ft), bring a down jacket, a hat, gloves, and a scarf. It's better for women to avoid shorts and miniskirts.